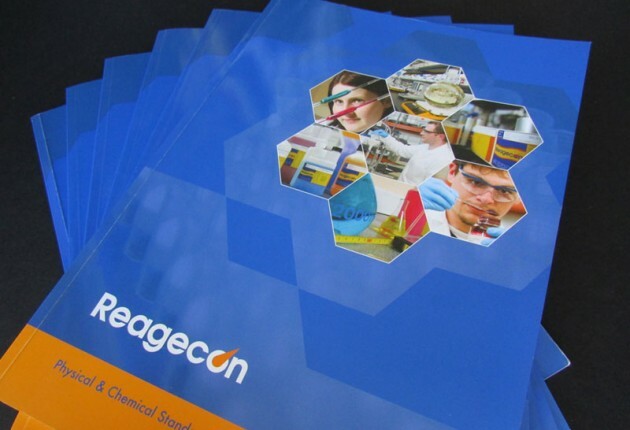 Shannon-based Reagecon Diagnostics is one of the largest producers of physical and chemical standards and reagents. They develop, manufacture, test and export certified and accredited physical and chemical standards, offering in excess of 4,000. They also supply over 100,000 separate pieces of laboratory consumables, apparatus and equipment. Reagecon has won the Best Established SME Award at the National Final of the 2014 Ulster Bank Business Achievers Awards. Blink Design was delighted to commence work with John Barron, Managing Director and Michelle Hynes, Product Manager of Reagecon in the summer of 2012 and we have been since engaged in ongoing projects with the team. We learned quickly about the range of products and services that Reagecon provide. 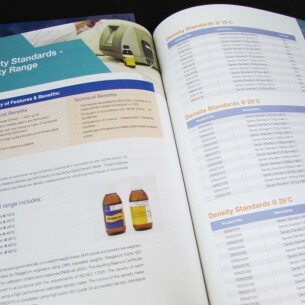 Our first project involved the design of their new Physical & Chemical Standards catalogue. 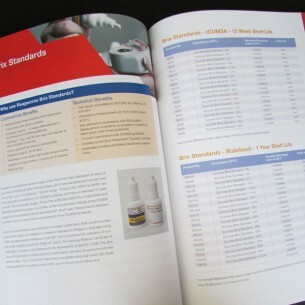 This was an extensive 106-page A4 catalogue printed perfect bound, full colour throughout. Focusing initially on the front cover, we experimented with several variations. Adhering strictly to the brand identity and corporate colours (which are working very well), we also conveniently incorporated in-house stock photos that were specific to the Reagecon products and services. 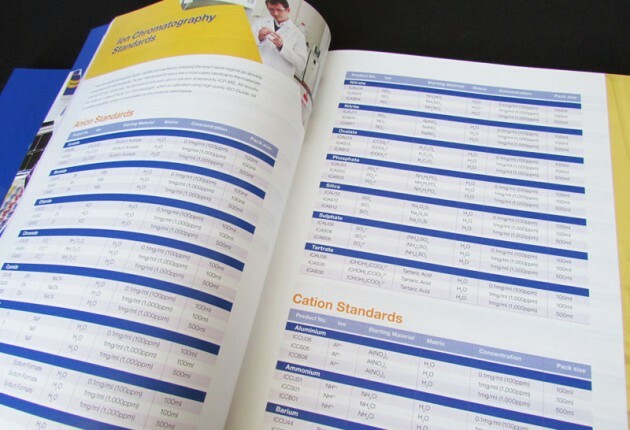 Working with their navy, orange and white corporate colours, we also implemented a secondary colour palette to aid colour coding the catalogue, which contained twenty one sets of standards. See examples of this 2012 edition catalogue to the left. The overall style is clean and corporate, containing detailed, technical information for all products under several categories and includes tables throughout. 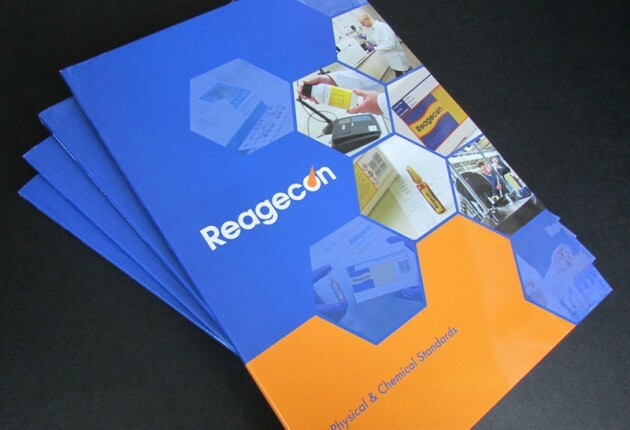 In 2013, we designed the new and up-to-date Reagecon Physical and Chemical Standards catalogue. This edition had grown considerably to a 212 Page A4. Since the publication of their 2012 laboratory reagents catalogue, substantial changes had occurred in the field of analytical chemistry. Stringent regulatory demands combined with major economic implications and increased competitiveness made it necessary to validate every analytical test performed, either in the laboratory or in the field. Not only must the correct result be obtained, but proof must also be provided of its fitness for purpose, validity and accuracy. Such proof must then be accessible, retrievable and presented in an easily understood format. Reagecon continues to respond to these challenges by presenting to its customers an ever-increasing range of highly-specified, stable, traceable and certified standards. Consistency is key and we have worked with the team on numerous projects including PowerPoint Presentations where we re-designed the template, incorporating the strong and consistent branding, creating a very clear and easy-to-follow presentation for their target audience. We have also designed various exhibition panels that have travelled as far afield as Pittcon in the USA, CHINA LAB, ARABLAB and Analytica, Munich. Posters have been designed to specific dimensions. e.g. A0 and 1.5 metre high, working to the exhibition guidelines. The fact that they areindividual product posters allows complete flexibility. It also allows customisation when working with a small or very large exhibition space. The transportation of these posters also reduces the cost of larger exhibition materials when travelling internationally. As required, we also look after any ad-hoc design elements including stationery and advertising. We look forward to working with Reagecon on their next project. Log onto www.reagecon.com to learn about this Shannon based company.